TRIPOLI (Reuters) - A parliament set up in Libya to rival the elected assembly has suspended U.N.-sponsored peace talks because of what it called fresh violence from the country's recognized government, a spokesman said on Wednesday. The rival assembly, known as the General National Congress (GNC), was set up after an armed group called Libya Dawn seized the capital, Tripoli, last summer. The internationally recognized prime minister, Abdullah al-Thinni, transferred his government to the east. However, GNC spokesman Omar Hmeidan said representatives of the Tripoli assembly would not now take part in any U.N.-sponsored talks, accusing troops allied to the opposing government of storming a central bank branch in the eastern city of Benghazi and other acts of violence. Troops loyal to Thinni took over the central bank branch in Benghazi after expelling Islamist fighters from the area, a commander told Reuters. 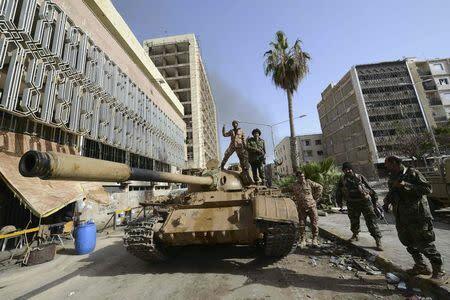 A Reuters reporter saw damage to the central bank building, which is located near Benghazi port - the scene of heavy battles for weeks between Thinni's troops and Islamists such as Ansar al-Sharia. On Sunday, the GNC had accepted the U.N. dialogue so long as the meetings took place in Libya, not Geneva. But Hmeidan made clear that the Tripoli assembly no longer had any intention of taking part in the talks, regardless of where they were held.